Facebook gave financial boosts to numerous community projects Wednesday when the Facebook Prineville Data Center awarded $210,000 in 2019 Community Action Grants. Funding will help build bike trails and a splash pad and will bring new technology into classrooms. 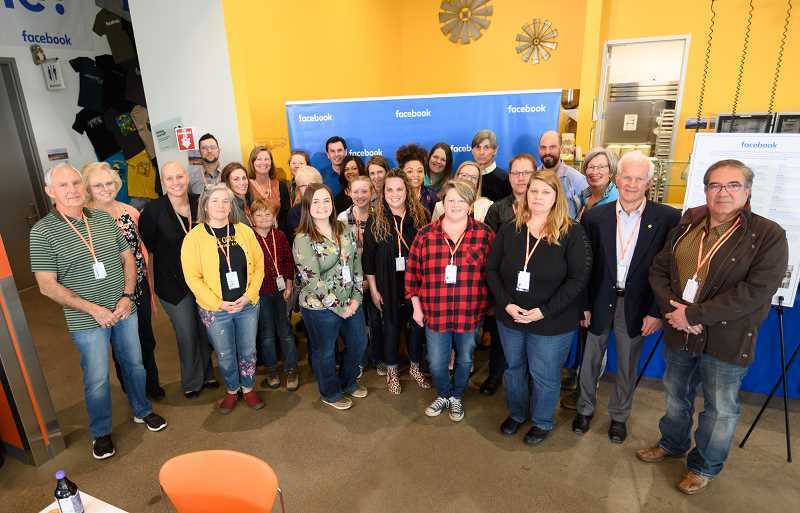 "Facebook's Community Action Grants is a program created to address needs in Crook County by putting the power of technology to use for community benefit, connecting people online or off, and improving STEM education," said Andrew Gold, site manager at the Prineville Data Center. "Facebook is invested in the long-term vitality of the community, and this year, 18 nonprofits and schools were awarded grants to support short-term, high-impact projects." Central Oregon Trail Alliance received the single highest grant, $44,641.12, which will support building mountain bike skills pods along the 66 Trail System. This is the third grant COTA has received, totaling nearly $100,000. Amber Toomey of COTA said thanks to that funding plus a ton of sweat equity by COTA volunteers, Prineville's trails are becoming a huge asset for both locals and visitors. The Crook County School District received nearly $70,000 for nine different projects, including a greenhouse project, new math and STEM workshops, lighting for the auditorium, and software. "One of the many benefits Facebook brought was its active, participatory presence in the community," said Prineville Mayor Steve Uffelman. "Facebook has contributed significantly to the schools on a variety of fronts by helping with technology as well as providing sports uniforms among other contributions. Above and beyond all negotiated agreements, Facebook provides community grants to aid local projects and needs. Facebook has treated the city well." Grant recipients attended a private reception Wednesday afternoon at the Prineville Facebook Data Center. "The Community Action Grants initiative is an important program that allows Facebook to promote STEM education and positively impact the community," Gold said. "We are incredibly proud to work with these schools and nonprofits who share our goal of helping Prineville be a wonderful place to live and work." Barnes Butte STEM Club – $1,000: This grant will support a variety of STEM projects, including Arduino kits, rockets for an aerospace unit lesson and materials for building projects. Better Together Central Oregon – $10,000: This grant will help establish an internship coordination system in Prineville, linking the business community and schools with meaningful internship opportunities. Central Oregon Trail Alliance – $44,641.12: This grant will support building mountain bike skills pods along the 66 Trail, to be built by volunteers. Additional budget will go toward maps, a kiosk, benches and picnic tables. Central Oregon Intergovernmental Council – $18,450: This grant will support COIC's ability to serve students through smart-board technology interfaced with laptops to create an interactive learning experience. Crook County High School - Art Department – $5,650: This grant will provide photo and video equipment, software, drone cameras, and licensing for the art department to create a semester-long, project-based elective every semester. Crook County High School - Eugene Southwell Auditorium – $14,000: This grant will provide a professional-level lighting system for the auditorium, which also serves as a community performing-arts space. Crook County High School - Script Writing Software – $2,600: This grant will provide site licenses for the high school computer lab, to be used by several classes including the Advanced Drama, Creative Writing and Playwriting programs. Crook County Kids – $6,497.98: This grant will help with STEM learning through the purchase of Sphero robotics kits, which teach programming and coding skills through customized lesson plans. Crook County Middle School – $3,059.90: This grant will support computer hardware and software to enhance movie-making, storytelling, and writing and editing skills. Crook County Parks and Recreation Foundation – $5,000: This grant will help to support a Movies in the Park series. Crook County School District – $12,916: This grant will support literacy in Crook County by using Educational Software for Guiding Instruction, a web-based assessment and reporting system. Crook County School District – $9,500: This grant will support creation of a Growing Spaces greenhouse for STEM education. Crook County School District – $6,225: This grant will support the school district's benchmark assessments through the use of the Leveled Literacy Intervention system. Crook County School District – $14,660: This grant will help provide Lego Mindstorm kits, solar car challenge kits, windfarm kits, and additional hardware and software to support STEM and literacy in the school district. Crooked River Watershed Council – $22,300: This grant will support local participation in the Oregon State Career Technical Education (CTE) program, helping students realize professional development opportunities in Technology, Agriculture, Culinary Arts, Business/Marketing and Mechanics, and Natural Resources Management. High Desert Museum – $5,000: This grant will support art and landscape design projects for Crook County High School students, fostering a passion for the arts, connecting them to their community, and challenging them to explore innovative approaches to the arts. Stepping Stones – $3,500: This grant will help combat generational poverty by providing access to technology, after-school programs, financial education, and more to thousands of low-income families, veterans, refugees, seniors and people with disabilities. The local program will focus on senior residents at Ochoco Manor in Prineville. Prineville Kiwanis Foundation – $25,000: This grant will help support construction of a community splash park.